Verizon (VZ) is the largest wireless service provider in the U.S. The firm was founded in 1983 as Bell Atlantic but became Verizon in 2000 after its $65 billion merger with telecom giant GTE. The company’s 4G LTE network is available to more than 98% of the country’s population (over 320 million people) in over 500 cities. Wireless operations, which include voice and data services and equipment sales, generate close to 70% of Verizon’s revenue and account for nearly 90% of the company’s EBITDA. Wireline operations account for 23% of the company’s revenue but only about 12% of Verizon’s EBITDA. This segment includes traditional voice offerings, as well as pay-TV and internet services. The company has sold off many of its wireline assets in recent years to reduce its exposure to slower-growing, capital intensive areas of the sector. Media (7% of total sales – AOL, Yahoo, mobile content, digital advertising) and telematics are relatively small parts of the business and are currently not profitable. Verizon has admitted that its media business isn’t growing as well as expected, announcing in December 2018 it will take a $4.6 billion write-down on those assets. Verizon has paid uninterrupted dividends for over 30 consecutive years and has raised its dividend for 12 consecutive years. Verizon’s business is (slowly) expanding into newer areas such as telematics and the Internet of Things, but the company’s historical key to success has been delivering reliable wireless and wireline services over the best communications network in the country. Verizon routinely invests more than $16 billion annually to increase the capacity and reliability of its wireless network. Thanks to its massive investments in capital equipment and spectrum licenses, Verizon’s 4G LTE network covers more than 320 million Americans today. The company’s investments have also kept it at the top of RootMetrics’ rankings of wireless reliability, speed, and network performance for each of the last five years. The chart below shows overall performance metrics for the big four carriers. As you can see, Verizon continues to maintain a slight lead over AT&T (T) and remains significantly ahead of T-Mobile (TMUS) and Sprint (S) though those networks have closed some of the gap in recent years. 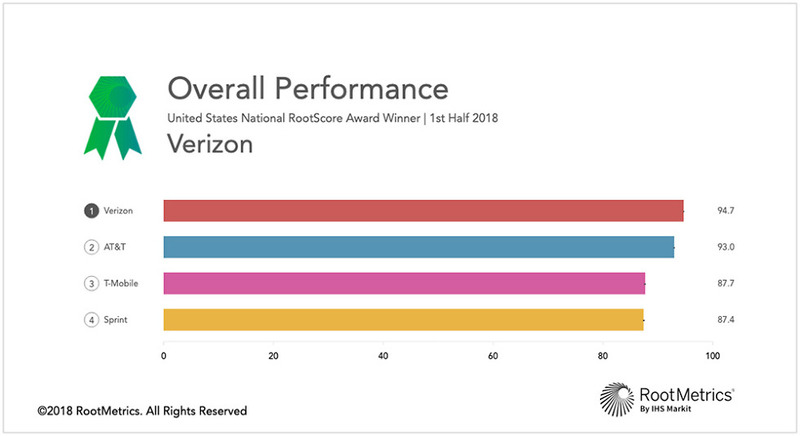 What’s more, Verizon’s network has won 21 consecutive network quality awards from Nielsen, and its network is currently ranked as the best for streaming. JD Power also assigned Verizon’s network top honors for the 21st straight time. The firm’s network leadership position has been built over decades and at a cost of hundreds of billions of dollars, which has helped Verizon become the 8th most valuable brand in the world. Consumers and businesses trust Verizon’s network reliability and reputation for superior performance, and the company’s thousands of brick-and-mortar stores keep its brand highly visible. As long as Verizon continues to invest in its leading network coverage and architecture, the company should continue maintaining a massive base of customers. Disrupting Verizon’s base of customers would be almost impossible barring a revolutionary change in network technologies. For one thing, growth in the number of new wireless subscribers has slowed considerably with smartphone adoption now being widespread. With new customer growth hard to come by, the industry has consolidated to become more productive and expand coverage. Verizon, AT&T, T-Mobile, and Sprint generate almost all of the industry’s revenue today, for example. Verizon’s large subscriber base (about 118 million retail connections) means it has about 40% market share according to Morningstar, compared to about 30% for AT&T. More importantly, that subscriber base provides it with the cash flow needed to support and enhance its existing wireless network. Potential new entrants lack the subscriber base needed to fund a nationwide wireless network and acquire spectrum licenses, effectively keeping them locked out of the market. Trying to win subscribers over from Verizon would be extremely costly and impractical for a newcomer. It’s a lot easier to maintain an existing large base of subscribers in a mature market than it is to build a new base from scratch. While competition between the four major carriers is intense, Verizon’s scale and leading market position have enabled its wireless segment to deliver excellent EBITDA margins of nearly 50% while generating predictable earnings. Simply put, new entrants lack the capital, spectrum, and subscriber base to effectively compete with any of the big four carriers in the U.S. In addition to the industry’s high barriers to entry, the wireless communications market is also appealing because its services are non-discretionary in nature. The majority of the company’s revenue is recurring because consumers and businesses have a continuous need to communicate and use data, even during recessions. As a result, Verizon’s post-paid churn rate (i.e. the percentage of customers who leave) in its wireless business has been stable near 1% or lower, even during the T-Mobile-induced price war. Even if the T-Mobile-Sprint merger is approved (far from certain), Verizon should remain the industry leader in wireless and continue squeezing out subscriber growth. At an investor conference on January 8, 2019, Verizon said it added 650,000 post-paid wireless subscribers in the fourth quarter of 2018, which means a full year net monthly subscriber addition of almost 2 million. Combined with a slow but steadily rising number of connections per account (3.2 on average, including smart watches and Internet of Things devices), this has allowed Verizon to return to positive growth in its high-margin wireless service business. As mobile and broadband usage continues growing with increased consumption of data and video, Verizon’s wireless network will become increasingly valuable – or at least that is what the company is banking on as it gradually exits wireline businesses and doubled down on wireless in 2014. Verizon sold off around a quarter of its wireline phone and internet operations for $10.5 billion in 2015, reducing its exposure to these slower-growing, capital-intensive businesses that could face increased regulatory scrutiny and cord cutting risk as consumers ditch landlines. The firm’s wireline business also carries an EBITDA margin near 20%, which is less than half of the wireless segment’s profitability. Verizon doubled down on its profitable wireless business in February 2014 when it acquired Vodafone’s 45% interest in Verizon Wireless for $130 billion. With full control over Verizon Wireless, the company continues to aggressively invest in its industry-leading network as it prepares for the continued surge in data consumption. While that deal did involve the company taking on a lot of debt, Verizon has managed to gradually reduce its leverage over time to maintain a strong balance sheet. As a result, the firm enjoys a solid BBB+ credit rating that allows it to borrow at reasonable interest rates and have the financial flexibility needed to pay generous dividends while making large investments in its network. Thanks to its strong focus on wireless, Verizon has historically enjoyed a two-year advantage on its competitors when moving to the next generation network architecture. With almost all of its wireless data traffic now riding on the 4G LTE network, Verizon has already begun work to get its network ready for 5G (fifth-generation) wireless technology, which is expected to deliver 30 to 50 times faster connection speeds than 4G. The company began conducting 5G trials during 2016 and in late 2018 started rolling out 5G in select markets, including Washington DC and Minneapolis. However, where Verizon’s 5G strategy differs from rival AT&T’s is that Verizon hopes to leverage the fast wireless internet speed connectivity of this new telecom standard to become a dominant internet service provider. The $65 billion U.S. residential broadband market, currently dominated by cable operators Comcast and Charter Communications, is Verizon’s first target of opportunity. In late 2018 the firm began rolling out 5G home internet into select test markets including Los Angeles, Houston, Sacramento, and Indianapolis. A much larger rollout is planned for 2019 for 5G-based home internet. Based on the latest pricing and internet speed data released by the company, Verizon’s offering appears to be very competitive compared to traditional home internet services available today. Of course, winning customers over in a mature market is easier said than done, so it remains to be seen just how meaningful this opportunity will be. However, management believes 25% to 30% of the home internet industry is addressable by 5G technology, potentially disrupting the oligopolistic home internet market while providing a meaningful growth avenue for the firm. Rather than rely on costly last-mile wires and pipes to deliver internet to consumers, Verizon’s technology essentially sends signals through its wireless network into a home, where those signals are then converted into Wi-Fi. While 5G’s impact on mobile devices is a little further down the road, its significantly faster speeds and responsiveness could be game-changers for many parts of the technology industry, including self-driving cars, robotics, virtual reality, and smart cities. Accelerated growth in these areas, fueled by much faster connectivity, could cause data usage to explode even higher, further increasing the value of reliable wireless networks. Of course, other mobile carriers are working on their own 5G networks as well. However, Verizon seems to have a clear lead. Sprint and T-Mobile are targeting a nationwide 5G network launch in late 2019 or 2020, according to The Wall Street Journal. It will likely take years before the impact of 5G technology is fully known, so Verizon has been busy exploring growth opportunities outside of wireless and 5G technology, including new business models focused on video, content, and the Internet of Things (IoT). Within the IoT umbrella, telematics, smart energy, lighting, agricultural technology, and other applications are driving strong demand in this area. Verizon hopes that eventually subscriptions of these connected devices will become a major revenue driver. But despite the excitement around these initiatives, they aren’t likely to be moving the needle for Verizon anytime soon. For example, IoT revenue accounts for less than 1% of sales. Significant revenue streams from these relatively new businesses are likely at least a few years out, and that’s if everything goes according to plan. It’s still uncertain how much revenue billions of new 5G internet-connected devices can bring in for the company. Regardless, Verizon’s investments in these areas underscore the evolution that is occurring in the telecom industry. Besides making selective investments in areas that offer the potential for faster growth, Verizon is pulling levers to save money as it contends with an intensively competitive and saturated wireless market. Specifically, the company announced plans in late 2017 to cut $10 billion in costs by 2022. This includes adopting a zero-based budget method, in which all annual budget decisions are made independently of previous years rather than assuming all budgets automatically grow over time. These actions will free up more cash for the firm to continue investing in its wireless network and new growth opportunities while continuing to fund its dividend. Tax reform also helped boost Verizon’s operating cash flow in 2018, allowing it pay off over $4 billion in debt while also contributing $1.7 billion to its pension plan. This deleveraging is further strengthening the firm’s dividend safety profile. Overall, Verizon seems likely to remain a key player serving the communications needs of millions of consumer and businesses for many years to come. With the company now almost entirely focused on becoming a dominant player in 5G wireless and internet, investors can likely expect low to mid-single-digit annual growth in earnings over the long term. But while Verizon’s recession-resistant business model and generous dividend make it an attractive income stock, there are still risks investors need to consider. Arguably the biggest uncertainty facing Verizon is future growth in wireless. Subscriber growth has slowed to a crawl as U.S. smartphone penetration has more than tripled since 2010 to exceed 85% today, according to a study conducted by the Consumer Technology Association. The industry’s saturation has caused the big four carriers to fight each other more aggressively for existing subscribers rather than behave like a rational oligopoly. T-Mobile and Sprint have worked hard to improve their networks’ coverage and quality in recent years, too. While they still score below Verizon’s network almost across the board in quality and coverage measures, the gap has narrowed, making it less painful for consumers to switch services. With over 70% of U.S. counties having coverage from at least four wireless providers, according to data from Mosaik cited by The Wall Street Journal, consumers have more options than ever before. Perhaps more importantly, T-Mobile’s growth strategy has been very aggressive in recent years. The company has shaken up the industry by bringing back unlimited data plans and dropping two-year contracts. As a result, Verizon has lost some of its ability to charge a premium for its network quality (and even reported its first-ever quarterly net loss of wireless subscribers in early 2017). Verizon has since stabilized and continued growing its subscriber base by bringing back its own unlimited data plans, but the industry’s era of lower phone bills appears to be the new normal. Even the proposed T-Mobile-Sprint merger doesn’t necessarily ensure a future price war won’t pop up. T-Mobile is famous for its Amazon-like approach to trying to win market share at the expense of short-term profits. Another risk to consider is Verizon’s questionable acquisitions in the past, most notably the $9.2 billion it paid for AOL (acquired in 2015) and Yahoo’s (2017) internet businesses. These sites are two of the 10 most-popular web properties in the U.S., according to Bloomberg. Through these deals, Verizon gained a mobile advertising platform and a host of online content, including The Huffington Post and TechCrunch. Verizon presumably has plenty of data surrounding its customers’ mobile behaviors, which could give it a chance of challenging Google and Facebook in the mobile advertising market. In 2017, Verizon combined its media assets into a new segment, Oath. While it’s impact on overall results was relatively small, the firm hoped to grow Oath’s revenue to between $10 billion and $20 billion in 2020, which would have represented around 8% to 15% of Verizon’s total revenue today. However, Verizon’s attempts at online advertising appear to have hit a brick wall. According to analyst firm eMarketer, Oath (now rebranded Verizon Media), is expected to grow revenue by just 2% in 2019 compared to nearly 18% growth for the online ad market. Meanwhile, eMarketer expects Amazon’s (AMZN) new ad business to continue winning market share by achieving 50% annual revenue growth for several more years. Verizon was attempting to diversify its business into online advertising under the belief that it could leverage its customers’ wireless data usage into high-margin ad revenue. However, Facebook (FB), Alphabet (GOOG), and Amazon command the majority share of the online ad business, and Verizon’s fourth-quarter 2018 write-down of $4.6 billion on its online media business shows that management is admitting it can’t effectively compete in this space. Fortunately, Verizon’s bets in these areas weren’t huge compared to the overall size of its business. Stepping outside its core competency proved to be a risky bet, so now Verizon is once again focusing almost exclusively on growing its core wireless business with a major resources going towards 5G. In other words, Verizon will continue to live and die by its wireless business. If growth in the wireless market weakens, the battle between incumbents for existing subscribers could intensify and further pressure the industry’s margins. There are also risks with Verizon’s 5G investments, which are still very much in the early days and far from being proven. As other competitors invest heavily in 5G (T-Mobile and Sprint hope to be more competitive if their merger is approved) and non-traditional rivals, such as Google and Facebook, explore creating their own mobile wireless networks and internet services, the telecom sector seems likely to continue evolving faster than it ever has before. Basically, Verizon has now realized that its future isn’t in branching into new industries but dominating its existing core competencies. The company hopes that 5G will allow it to become a leading name in internet as well as maintain its lead in U.S. wireless. However, increased competition from T-Mobile and others could result in 5G not proving to be nearly the growth catalyst that management and investors hope for. If one thing is clear, the telecom industry is undergoing a meaningful evolution. Content, media, and communications are converging like never before, and Verizon is one of many players working to reinforce its position in the market. For now, Verizon appears to remain a reliable income stock, one that seems likely to continue its streak of paying uninterrupted dividends for more than 30 consecutive years. The company’s scale, hard-to-replicate network assets, mission-critical services, brand recognition, and massive subscriber base remain important competitive advantages. Because management is working hard to cut costs, reduce debt, and invest heavily in 5G, Verizon should become even better positioned to deal with intensified competition in wireless markets. Overall, Verizon seems likely to continue generating predictable results in the years ahead. However, investors need to keep a close eye on future developments in the wireless market, especially given the company’s capital intensity and large debt load.